Life is full of surprises, so much can change either, slowly, gradually and sometimes, instantly. Change is a great thing when it’s positive, when you’re moving in the right direction and making good decisions that propel you to new heights. But what do you do when change is negative? Instead of lifting you higher it is pulling you back. We all make mistakes but how do you feel about yourself when you make the same mistake more than once? It can be very discouraging and can have you questioning or second guessing yourself. 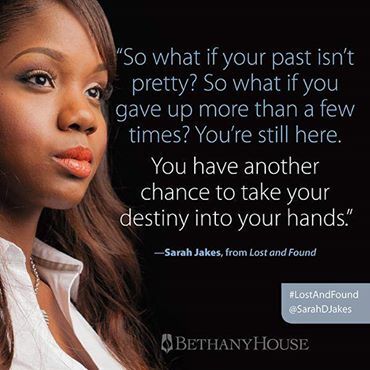 While asking all these questions I came across a beautiful blog post from Sarah Jakes who took the words right out of my mouth about how I feel and gave me more than a few pointers to ponder. I know how difficult it is to let go when you believed so fervently that it was meant to be. I know what it’s like to watch a dream play in your head that you no longer believe will exist in your life. I recognize the fear that comes with the unknown. Redefining your tomorrow to fit your reality is never easy. You can’t start the journey of becoming whole unless you admit parts of you are missing…Can you identify what the pieces are and when life chipped them away? Do you know when you lost you? I know you want the purpose without the process, but right now you cannot have what you want and become the person God needs. Learn to trust His timing. Don’t let your impatience interfere with the process. It’s hard to not become discouraged when you see everyone moving around you, yet you’re still trying to find your way. You cannot force change, you can only inspire it and you can’t inspire any one who won’t let you in. You became so numb you forgot what it was like to feel. You forgot to live. You locked yourself out of your tomorrow and forgot how much confidence comes when you can inspire yourself. I think it’s time to let go of what you can’t control and accept the things within your power to change. If you can’t fix it it’s because God wanted you to trust Him and if you truly trust Him show Him by letting go. She then goes on to write about the new… which in my words I wouldn’t really describe as the new but perhaps the unknown. You scare me. I won’t get into how exciting you are because everyone can see that. I want you to know that I believe it’s my time and I’m coming for you. My hopes are set on bringing out the best of me every chance I get. I just want to be honest and say I’m not sure the best of me will be enough. I just wanted to explain the tremble in my hand and the cracks in my voice. I wanted you to understand I’m coming to slay my giant with a slingshot. I know they say the odds are against me, but I have the greatest force of all with me. God has trusted me with this mission for reasons I can’t explain so everyone I encounter must see a glimpse of Him in me. I have no room for fear or doubt in my life, yet they’re still here. Each day I pursue my purpose I give my fear an eviction notice. It may never fully go away, but at least it knows it’s not welcomed and it won’t stop me from living. My fear is my audience and I can’t wait to put on this show. I’m afraid of failure. I’m afraid of criticism. I’m afraid of rumors. I’m afraid that my heart will be questioned, but bigger than all of that I’m afraid to be out of God’s will. I just didn’t realize that being in His will may mean that I have to face the other fears head on. And finally something which I would perhaps not express as being my forever, because in this world where nothing is guaranteed, what is forever? Forever can change tomorrow. From the moment our eyes locked I knew that God trusted you to keep me focused. There are some people you know are only in your life for a season and others you know were a gift from God to help see you through. You are my forever. And while I know this is the time of the year when many reassess the relationships in their lives I want you to know your role cannot be questioned. During my most scorching pain your love has been my favorite breeze. Even when I wanted to face things alone to spare you from my shame, you found a way in. You make me a better me and I could never let that go. There are many uncertainties in life, but you are not one. Life is too unpredictable to have a team you can’t depend on. You always show up, suited, and ready to tackle whatever obstacle lies ahead of me. And because I value you I don’t abuse my access to your strength. I had to let go of a few old things to hold you. I finally turned my back on my past so I could really see you. I won’t allow my love to be filtered with bitterness. I won’t force my tomorrow to live in my past. Thank you for protecting my innocence with your wisdom and being gentle with my fears. Thank you for being careful with my once broken heart.